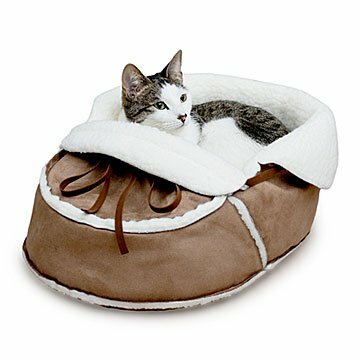 With this around the house, your pet might just leave your other footwear alone. My human never seems to realize how many ways there are to use those shoes on your feet: toy, snack, secret place for hiding half-eaten surprises. But this shoe? It's big enough for us small dogs or cats to curl up and sleep in. It's the perfect shape, with one end for hiding, and a top opening for peeking or pouncing. It's also fleecy warm on the inside, and my human can throw it into the washing machine to freshen it up. With this around the house, we might just leave your other shoes alone. Ok, probably not. Designed by Leeling Ho; handmade in Brooklyn, NY. Click here to see the Care Instructions.